This elegant hotel, Eurostars Patios de Cordoba, is located in the city of the integration of the different cultures, called Cordoba, right in the Jewish Quarter. The entire area is full of history, and everything is close, the Mosque-Cathedral, the Alcázar Castle and the Museum of Fine Arts. Without going to far, under the land that the hotel occupies, there are still archaeological remains, such as Roman tombs, a well, hydraulic fountains, an Almohade wall and even a well from the Caliphate. 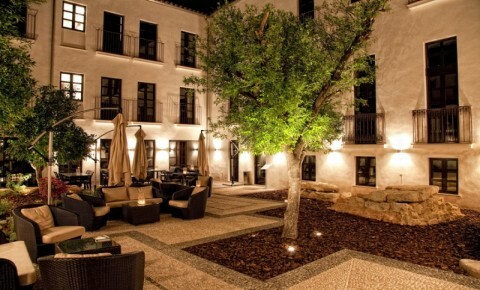 This beautiful hotel, has 65 rooms and their decoration has been inspired by several well-known characters of the history of Cordoba, such as: Seneca, Góngora, Abd-ar-Rahman III, Julio Romero de Torres, etc. All of the hotel rooms are modern, and very comfortable with an elegant design and classic decoration, fully equipped with all modern technology and comforts. The hotel has a bar where you can relax and have a coffee, tea or a drink. The Eurostars Patios de Cordoba is so close to so many historic sites, that even if you go on a business trip a have little time to spend, you will still be able to make time to do some sightseeing.